For companies to remain competitive it is vital that their business at any time is optimally supported by flexible IT solutions and therefore they cannot afford to remain on out-dated and expensive technologies. It is one of the reasons why many companies are looking for solutions to modernize their IT solutions in order to reduce costs while momentum is maintained. Xact offers a 100% automated source code migration from a number of legacy languages: CA Gen (previously Cool:Gen), CA Ideal/Datacom, Natural/Adabas, VAG. Different source and target platforms are also supported: Mainframe z/OS (CICS/IMS), Linux, UNIX and Windows. The migration tool is developed by Xact and has been used for the last decade to run successful migration project for large global companies. 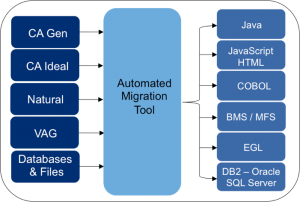 The automated migration gives the customer maximum flexibility during the whole migration process and minimizes the code freeze period. Converted code will comply with customer standards and both restructuring and refactoring during migration is possible. 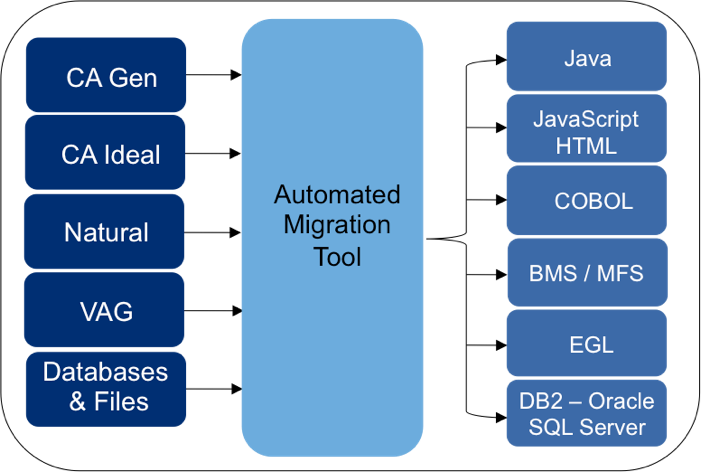 Examples of different types of automated migrations that Xact have done in the past.